Sims Metal Management will write off goodwill of $614 million or $594 million after-tax in its half year results to 31 December. The non-cash impairment is mostly from its North America segment and relates to acquisitions and joint ventures before 2007-08. The company said it attributes the impairment to the timing and valuation of previous significant acquisitions of traditional scrap metal recycling companies before the global economic downturn and US recession. Dividends and the share buyback will not be affected. The company expects underlying earnings (EBITDA) before the goodwill impairments and other adverse items of around $15 million to be about $141 million compared to $138 million in the previous corresponding half. First half results were impacted by difficult operating conditions and margins for its traditional metals, particularly in North America. Results for Australasia and Europe excluding the UK traditional metals business were solid, and results for Sims Recycling Solutions were in line with the prior corresponding half. Tox Free Solutions has welcomed the approval by DoloMatrix shareholders of the deal for Tox to acquire the assets of DoloMatrix International. Managing director Steve Gostlow said "These businesses will add significantly to our existing hazardous waste platform and will position Toxfree as the industry leader in this segment of the market." selected project, Moree Solar Farm, to meet its financing requirements. Moree Solar Farm and the three other projects - from Infigen-Suntech, AGL, and TRUenergy - can update their applications for reassessment by the Solar Flagships Council. A $306.5 million grant is on offer to build a large-scale, solar photovoltaic power station. A decision is expected in the second quarter. Shares in Clean TeQ Holdings have staged am impressive turnaround, quadrupling in three weeks from 3.4 cents to 14.5 cents on 9 February. The shares initially jumped on news of a joint venture with Tokyo based Nippon Gas Co to provide water desalination services to the coal seam gas sector. But they kicked on when soon after Clean TeQ also announced $3 million in new contracts for the design and construction of air capture and purification systems for two wastewater treatment plants in NSW. The projects will use Clean TeQ's OdourTeQ biological air treatment technology that is cost effective for treating odours from municipal wastewater. The company said winning the two projects adds substantially to its current project work and reinforces its position as the leading supplier of biologically-based air pollution control systems in Australia. DoloMatrix International shareholders approved the sale of the company's assets to Toxfree Solutions. 70 per cent voted for and 30 per cent against the proposal and the related capital return. Enerji and Energy Developments are evaluating sites for Enerji's Opcon Powerboxes in Queensland and Western Australia, as per their October 2011 cooperative agreement to look at sites nominated by Energy Developments. These include greenfield and brownfield opportunities and cover new mine developments, mine expansions and retrofitting existing sites where energy efficiency improvements and fuel costs savings are sought. Simon Henry has continued to increase his interest in Hydromet Corporation and has now reached 14.3 per cent. (ASX: HMC). August Investments has made an investment in carbon sink developer Carbon Conscious. August Investments said "Financially the company is profitable, receiving fees to plant the trees from large Australian companies. Profit has been growing at a fast rate, with projected earnings of 4 cents per share for 2011-12 - a 309 per cent increase over the previous year. "The environmental benefits of planting trees on degraded land is obvious, but the company's reliance on just one species is somewhat of a concern - monocultures can be prone to diseases. But overall we see this company as positive, although still speculative. "We compared Carbon Conscious with a similar company, CO2 Ltd. Carbon Conscious seemed to provide the best value to shareholders." Ceramic Fuel Cells' BlueGen unit at the Sydney Smart Home trial produced six times more electricity per day than solar PV and nearly twice as much electricity than was needed during the home's first 18 months of operation. Ausgrid's energy efficiency expert Paul Myors said "The fuel cell used gas and waste heat to produce most of the on-site power, but with 65 per cent less greenhouse gas impact than power sourced from the grid." The 1.5 kilowatt BlueGen unit  combined with a conventional 1 kilowatt rooftop solar system and a 0.5 kilowatt solar pergola system  produced an average 32 kilowatt hours of electricity per day. Of this, the BlueGen unit produced an average of 28 kilowatt hours per day, and the average solar output was 4 kilowatt hours per day. The BlueGen unit saved 6,950 kilograms of carbon dioxide in the year from November 2010 to October 2011 compared to greenhouse emissions from the NSW electricity grid. This was nearly five times the carbon emission savings from the Smart Home's solar PV unit, which saved 1,470 kilograms of carbon dioxide. The family charged the home's car  a new Mitsubishi i-MiEV electric vehicle  an average of eight times per month and drove it for more than 5,000 kilometres. The electric car added an average 2.5 kilowatt hours a day to the home's electricity use. Ausgrid found the electric car would have been about 75 per cent cheaper that a comparable petrol car to run, as it was only charged after 8 pm when electricity rates were cheaper. "The Smart Home in essence has become a fully functioning power station," said Mr Myors. Last year Ausgrid ordered 25 BlueGen units as part of the $100 million Smart Grid, Smart City project and these are now operating in homes in Newcastle. Meanwhile the UK Government plans to increase the feed in tariff for micro Combined Heat and Power (m-CHP) in October from 14.1 pence to 15.6 pence. This will comprise a generation tariff increase from 11.0 pence to 12.5 pence for every kilowatt hour of electricity generated on-site, plus an export tariff of 3.1 pence for every kilowatt hour exported to the grid. Ceramic Fuel Cells' managing director Brendan Dow said the proposed tariff increase is a step in the right direction, but not as high as was sought by leading suppliers. Intec has a new managing director, and has raised $1.25 million through a share placement. The board expressed its sincere appreciation for Mr Wood's longstanding service to the company, including as its managing director and chief executive officer since 2001. 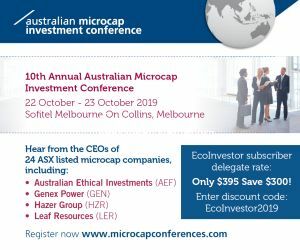 The placement was for 83.333 million shares at 1.5 cents each to a small number of investors, including clients of stockbroker Taylor Collison Ltd.
$487,092 of the placement has been allotted immediately under the ASX's 15 per cent placement capacity rule, and shareholder approval will be sought for the remaining $762,908, including a separate approval for the participation in the placement $220,000 by director and new managing director Mr Rodgers. Po Valley Energy has recommenced gas production from the Vitalba1dirA well north of Milan. Output of about 0.5 million standard cubic feet per day (scfd) will gradually increase to a target of 0.7 million scfd. The company also said production at its Sillaro field is still impacted by the extreme weather conditions in northern Italy. The Sillaro field normally produces from two wells, Sillaro 1 and Sillaro 2. Recently, the gas has been yielding minor quantities of condensate, however, with the colder winter temperatures, condensate production has increased. The Sillaro 2 well is currently producing 1.6 million scfd. "As a precaution, production from the Sillaro 1 well, where the condensate was believed to originate, will be brought back into production gradually while the situation is fully evaluated," said Po Valley Energy chief executive, Giovanni Catalano. "As a result production from the Sillaro field is expected to be between 1.6 million and 2.8 million scfd in the interim." While the condensate levels are low, they may reach a level requiring the installation of standard condensate processing equipment on site. "Restarting production at Vitalba was a key objective for Po Valley. The temporary reduction of production from the Sillaro field is disappointing, however, condensate management is a straightforward operational issue and should not impact the long-term economics of the field. RedFlow has appointed Howard Stack to its board as non-executive chairman. These companies include Bow Energy, Flight Centre, and Australian National Industries. Mr Stack was a partner of national law firm Allen, Allen & Hensley, and until 2011 was a corporate advisor to one of Australia's largest electricity generators. Vmoto has commenced shipments of its 120S Electric scooter to Malaysian electric vehicle company, Eclimo Sdn Bhd. The initial order is for 1,274 rolling frames in completely knocked down (CKD) form. The first 72 units are underway with another 216 units leaving this month. Subsequent shipments will be three containers per month to July 2012. Vmoto said it anticipated that a further supply agreement will be negotiated. The CKD units consist of all components other than batteries and the electric motor, which are supplied independently. Eclimo holds one of two licenses for the manufacture and distribution of electric scooters in Malaysia. Malaysian law requires that products are predominantly assembled in Malaysia using local labour, so the scooters are shipped in CKD form and assembly is completed in Malaysia, said Vmoto managing director, Charles Chen. The scooter will be called the Eclimo ES 11. Eclimo is establishing new dealer premises to distribute the scooters. The Malaysian Government has embarked on an aggressive program to make Malaysia's transport systems the greenest in Asia and Eclimo has had substantial Government support with the project, said Mr Chen. Shares in WestSide Corporation quickly leapt to a six month high of 35 cents on 10 February after trading around 25 cents for the past six months. Updated coal bed methane (CBM) reserves and resources have increased Dart Energy's international reserves by 40 per cent and contingent resources by 400 per cent. The updates were commissioned as part of the restructuring process for Dart's international portfolio, and cover all Dart international CBM assets, including reserves and resources that will be attributed to Dart on completion of the recently announced BG Group and Greenpark transactions. The update confirmed commercial reserves at the projects in Liulin in China, Sangatta West in Indonesia, Airth in Scotland and at a fourth project, Canonbie, also in Scotland, that will transfer to Dart on completion of the Greenpark transaction. All of these project areas have near term sales gas potential. Dart expects that in 2012 it will be in a position to add further reserves in the UK and India, with potential for additional reserves at other projects in Poland and Indonesia. Dart International chief executive, John McGoldrick, said the hallmark of a successful business is the ability to take a large gas-in-place resource and progressively migrate it into the higher and more valuable category of contingent resource, and then into commercially saleable reserves. "The updated assessments show this process is working well at Dart, and we continue moving towards achieving our core objective of first revenues from sales production in 2012 and into 2013." Algae.Tec's executive chairman Roger Stroud has been appointed to the Advisory Board of the Fuels and Energy Technology Institute at Curtin University of Technology in Perth. The Fuels and Energy Technology Institute (FETI) has over 50 researchers and advanced facilities and instrumentation. It aims to be a centre of excellence in the field of energy science and engineering in the world. Research activities cover fossil fuels and renewable energy technologies. The Institute will carry out basic and applied research in energy and fuel conversions to develop advanced technologies that address national needs and to transfer these to the commercial sector. It is supported by funding from the Australia and WA governments, industry partners and the University. Mr Stroud said "This Institute has demonstrated that biofuels have Government and private investment support, which is critical for driving research through to commercialization in this fast growing sector." EcoQuest s shares leapt from 0.6 cents to 2.4 cents on news that it is to raise up to $1.22 million through a placement and rights issue. Forrest Capital Pty Ltd is to place 115 million shares at 0.5 cents per share. Each share will have a free attaching option with an exercise price of 1 cent by 31 December 2014. The placement is subject to shareholder approval. Forrest will also underwrite a proposed 1 for 2 rights issue to shareholders at 0.5 cents each and also with free attaching options. The conditional placement will raise $575,000 and the rights issue will raise $647,500. A representative of Forrest is likely to join the EcoQuest board. 9,230,769 shares and 4,615,384 listed options with an exercise price of 3 cents and expiring 30 June 2015. The funds will go towards installation of the first Opcon Powerbox at the Carnarvon Power Station. These include Greenfield and Bonfield opportunities and cover new mine developments, mine expansions and retrofitting existing sites where energy efficiency improvements and fuel costs savings are sought. Enerji chief executive, Greg Penne father, said "Energy Developments is well known for delivering safe, innovative, reliable, secure power generation in remote communities throughout Australia. It has over 276 MW remote area energy operations across 32 projects." Shares in Green Rock Energy fell to an all time low of 0.5 cents on 7 February. Kimberley Rare Earths has restructured its board with the appointment of Jon Parker as a non executive director and Gerry Kaczmarek stepping down. Mr Parker has strong corporate experience in the resource and energy sectors with 30 years in commercial, development and strategy roles, preceded by 10 years in technical roles. He worked with Rio Tinto for 26 years, then was managing director of Felix Resources and more recently managing director of Norton Gold Fields. La Jolla Cove Investors has converted another 4.22 million shares in MediVac at an average price of 1.06 cents. La Jolla is well known for converting large numbers of shares and selling them on market. Water Resources Group has completed a placement of 16,925,000 shares to raise $1,354,000 at 8 cents per share. Intersuisse Ltd acted as the placing agent with support from Patersons Securities Ltd. Ocean Power Technologies has reported a strong performance by its autonomous PowerBuoy in US Navy operations off the coast of New Jersey. Charles F. Dunleavy, chief executive officer of OPT, said the autonomous PowerBuoy exceeded the design specification and met all goals set by the US Navy in a variety of demanding ocean conditions. "The unique ability to supply persistent levels of power, with no routine maintenance requirements and in extended no-wave periods, represents an entirely new offering for satisfying offshore power needs. "We believe these results establish baseline capabilities for our autonomous product line in support of maritime security applications as well as other markets such as the offshore oil and gas industry, the oceanography community and aquaculture sector." Currently, systems requiring remote power at sea are often powered by diesel generators, which require maintenance and fuel replenishment. The OPT system requires no maintenance for three years. The PowerBuoy was designed to provide power for the Navy's radar and communications payload on a continuous basis of 150 W with an extended target to exceed this rating. The actual results were significantly better than expected as the PowerBuoy supplied continuous power in excess of 400 W throughout its deployment and produced peak sustained electrical power of 1,500 W.
This power more than supported its 150 W payload 24 hours a day, seven days a week, for the duration of the three month operations. The on-board power management and storage system allowed power to be supplied during extended periods with no wave activity.